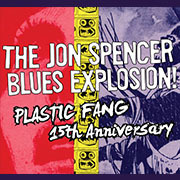 Sunday, April 9th marks the 15th anniversary of the Jon Spencer Blues Explosion’s seventh studio album release, Plastic Fang . Jon Spencer is most recognized for his notorious blend of punk and blues along with his unconventional recording methods. With an eccentric and prolific discography, Spencer can be heard in collaborations with Elliot Smith, Beck, Ad Rock and Steve Albini. Come by on Sunday for a heavy eclectic soundtrack to accompany your burgers and booze!